It’s time for the March Madness baby names 2018 girls final! 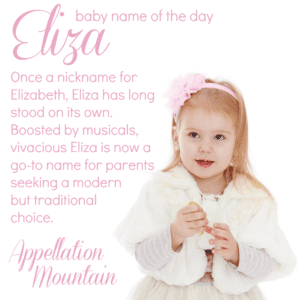 We started out with sixteen names, from the most-viewed posts at Appellation Mountain during the 2017 calendar year. Sloane, Esme, Phryne, Elodie, Anouk, Zosia, Rumi, Sabine, Vesper, Faye, Noa, and Leia were all eliminated going into the SemiFinals. That left just four names, and after they competed, we were down to our two finalists. Maisie fell to Marigold! I’m calling this an upset. Marigold has plenty of fans, but remains outside of the current US Top 1000. Maisie is the retro revival bounding up the popularity charts over the last few years. It proves, once again, that Appellation Mountain readers are ahead of the curve, and not afraid to embrace emerging names. Marigold earned a solid 54% of the vote, against Maisie’s 46%. Marigold advances! In the other match, Eliza beat out Elowen to claim the other spot in the Finals. This wasn’t as much of a surprise. While Elowen is beloved in naming circles, it’s relatively rare in terms of actual use. What’s noteworthy? This was not a blow-out by any means! Elowen garnered a respectable 40% of the vote, even though Eliza’s 60% takes the name into the last round. And that takes us to the very last girls’ competition for the season. Eliza started out as an Elizabeth nickname, Eliza-hold-the-beth. It has plenty of history, and some appealing associations. Audrey Hepburn famously played Eliza Doolittle in My Fair Lady, the poor flower girl who learns elocution from the snobbish Professor Higgins. George Bernard Shaw named the character in his earlier stage play, Pygmalion, inspired by Greek myth. The musical followed a few years later. Popular in the late nineteenth century, Eliza briefly appeared in the US Top 100. It might be headed back there again, a good mix of traditional and fresh. As of 2016, the name ranked #174. That’s the most popular showing in well over a century. So our first contender feels traditional, feminine, and at home in nearly any era. 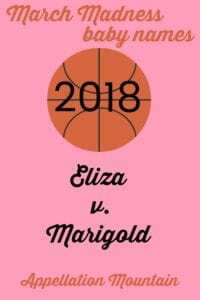 But Eliza faces a very different name in March Madness. Flower names like Lily and Rose sound like possible sisters for Eliza. But Marigold is different. 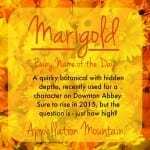 Downton Abbey made this botanical name familiar to a wider audience when Lady Edith chose it for her (secret) daughter later in the series’ run. 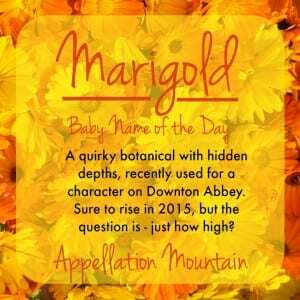 I’ve called it a quirky botanical with hidden depths, because Marigold comes from Mary’s Gold – a reference to legends about the Virgin Mary. Marigold has never cracked the US Top 1000, though a record high 93 girls received the name in 2016. That still puts Marigold a long way outside the Top 1000, but suggests that, like Sylvie and Louisa and other past March Madness baby name winners, it’s a question of when the name will reach that milestone – not if. 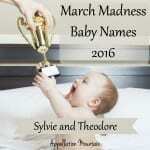 Time to vote, and choose our next March Madness baby names girls’ champion! Voting will remain open through Thursday, March 29th. Check back on Saturday, March 31st to learn which name wins the title! 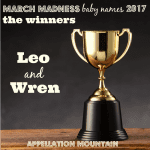 March Madness Baby Names 2017: The Winners! 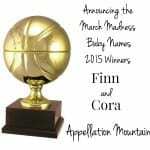 March Madness 2015: The Winners!